Want to help create a pro-life culture and want to make sure your gift will have maximum impact? Now is the time to give. 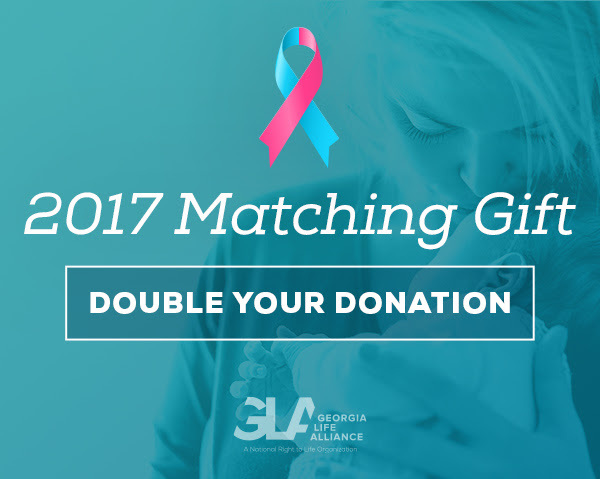 A generous individual has agreed to match any donations made to Georgia Life Alliance between now and the end of 2017 up to $25,000. Help us save more lives by acting now. For those of you who have been waiting to give or are planning end of year gifts, we need you now for maximum impact. Momentum is key. That is all you have to do. We will send the total to the donor who will write us a check to double the amount you gave. I did it earlier today and it could not have been easier. Help us create a pro-life culture that protects life from conception to natural death. Giving Tuesday is November 28th! You can be part of saving vulnerable lives in Georgia TODAY. We cannot create a pro-life culture on our own. WE NEED YOU! Without your help we will not be able to introduce pro-life legislation in January. Without your help no one will be making the issue of life important in the coming elections. Without your help we cannot continue to offer expert counsel to pregnancy centers. We are so thankful for your support. Without your help we would not have been able to use legislation to create a grant program to give $3 million dollars to pro-life pregnancy centers in Georgia. We need your help to make sure that money is available again next year to save even more lives. God has blessed our work and unborn children are safer today than they have been in years. But there is so much work to be done, babies are still being killed, and we cannot save them without your help. We need to raise $50,000 by the end of the year. Thankfully, a generous person has given us a $25,000 matching grant. That means we just need 250 people to give $100 or 100 people to give $250 and we will be able to continue saving lives, one valuable life at a time, as we create a culture that values each human life. Talk about an amazing return on your investment. Your $100 will help ensure that $3 million dollars in grant money goes towards saving lives at pro-life pregnancy centers. Georgia Life Alliance is the official affiliate of National Right to Life. We stand up for life in the legislature, the media, and election campaigns. We believe the right to life is the most important right and that it deserves our very best. That is why we are committed to acting with excellence, wisdom, and love, to create a culture where abortion is not only illegal, but also unthinkable.